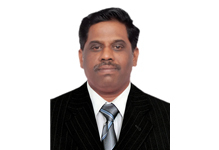 Dr. M. Periyasamy, Currently working as Principal in Syed Ammal Engineering, Ramanathapuram, He has obtained his Bachelor’s degree in Electronics and Communication Engineering from Alagappa Chettiar College of Engineering and Technology, Karaikudi in 1995 and completed his Master of Engineering in Control and Instrumentation from College of Engineering Guindy, Anna University, Chennai in 1998. He has completed his Ph.D in the specialization of Electromagnetic Interference from Anna University, Chennai in 2015. He has more than 20 years of teaching experience and out of which he has served in the Syed Ammal Engineering College for more than 18 years in various capacities such as Senior Lecturer, Assistant Professor and Professor. He was the Vice Principal of this college for the past 18 years. As a passionate teacher, he was very fond of teaching the subjects like Digital Signal Processing, Signals and Systems, Control Systems, Circuit Theory, Transmission Lines and Wave Guides, Medical Electronics, Wireless Communication, Electromagnetic Fields, Microprocessor and Microcontrollers, Digital Electronics and Antennas and Wave Propagation. During his tenure he has received many accolades for producing good results in University Examinations. As a Vice Principal of this college for the past 18 years, he played active role in development of the college in various aspects. He organized student symposiums, Faculty Development Programmes, Seminars and Workshops for students and faculty members. He took active role in organizing four IEEE conferences held in the college in 2010, 2012, 2014 and 2016. He was the convener of the various committees formed in Syed Ammal Engineering College. He has played key role in obtaining NBA accreditation for four branches in 2017. He established IEEE students chapter, IETE students and staff chapter and Tamil Sangam. He was the convener for conduction of Graduation Day and College Day functions in the college for the past 18 years. He organized two Anna University Sponsored Faculty Training Development Programmes for the subjects Control System Engineering and Signal and Systems. He acted as Nodal Ambassador for Smart India Hackathon - 2017 nominated by AICTE Southern Region. He has keen interest in research in the fields of Electromagnetic Interference from cell phones and their base stations, utilization of RFID systems in healthcare system and marine environment. He is the recognized supervisor in Anna University in Electrical and Electronics Engineering discipline. He has published 16 publications in various Journals and Conferences. He is the regular reviewer for IEEE, Springer and ACES journals. He is the Life Member of IETE, ISTE, Electromagnetic Society of India and Member of IEEE, IEEE PSES Society, IEEE Electromagnetic Compatibility Society and IEEE Communication Society. He strongly believes in team work, ethics and moral values. He desires that every individual should give equal importance to family and profession for the betterment of the individual concerned and nation.